Pitticite: Mineral information, data and localities. Minor, non-essential S, Si, Ca, P and Al may be present. Yellowish, reddish-brown, brownish red to brownish black, grey, nearly white; pale yellowish to reddish brown in transmitted light. from the Greek πίττǎ for "pitta" = pitch, for the pitchy appearance of the material. An amorphous Fe3+ hydrous arsenate sulphate of questionable validity. Chemical composition appears to be variable. 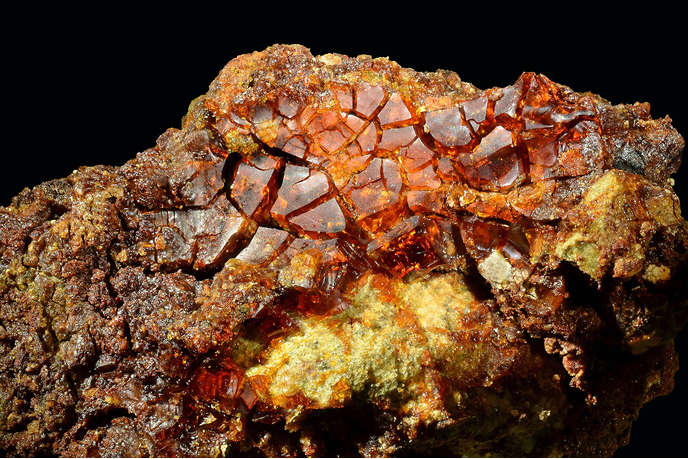 A secondary mineral formed at near-surface conditions from the oxidation of arsenopyrite, realgar, or orpiment; also forms as a recent deposit from mine and spring waters. Massive; reniform to botryoidal or stalactitic; opaline crusts; earthy; also as slimy coatings. Mimetite 6 photos of Pitticite associated with Mimetite on mindat.org. Olivenite 2 photos of Pitticite associated with Olivenite on mindat.org. Quartz 1 photo of Pitticite associated with Quartz on mindat.org. Readily soluble in acids. Decomposed by strong alaklies, leaving a residue of iron oxide. Karsten, D.L.G. & H.M. Klaproth (1808): Untersuchung des Eisenpecherzes, von der Christbescherung unweit Freiberg.- Der Gesellschaft Naturforschender Freunde zu Berlin Magazin für die neuesten Entdeckungen in der gesammten Naturkunde III, 191-194 (as Eisenpecherz). Haüy, R.J. (1809) Tableau comparative des résultants de la cristallographie et de l’analyse chimique relativement à la classification des minéraux. Paris: 98 (as Fer oxydé, resinite). Hausmann, J.F.L. (1813): Handbuch der Mineralogie.- Göttingen, 1. Band, S. 285-286 (as Pittizit). Hoffmann, C.A. S. (1816) Handbuch der Mineralogie volume 3, b: 302 (citing Werner) (as Eisensinter). Hoffmann, C.A. S. (1817 [1818 ?]) Handbuch der Mineralogie volume 4, a (b ? ): 141 (as Eisensinter). Beudant, F.S. (1832), Trailé élémentaire de Minéralogie, second edition, 2 volumes: 2: 609 (as Sideretine). Stromeyer (1843) Annalen der Physik, Halle, Leipzig: 61: 181. Breithaupt, A. (1847) Vollständige Handbuch der Mineralogie. Vol. 3: 1022 (as Pitticit). Rammelsberg, C.F. (1860) Handbuch der Mineralchemie. First edition, Leipzig: 384. Church (1871) Chemical News and Journal of Industrial Science, London: 24: 136. Rammelsberg, C.F. (1875) Handbuch der Mineralchemie. second edition: 355. Genth (1890) American Journal of Science: 40: 205. Pilipenko (1907) Bulletin of the University of Tomsk: 28: 1. Barthoux (1925) Bulletin de la Société française de Minéralogie: 48: 106. Foshag and Clinton (1927) American Mineralogist: 12: 290. Hintze, Carl (1931) Handbuch der Mineralogie. Berlin and Leipzig. 6 volumes: 1 [4B]: 1067. Dessau G. (1932), Le proprietà magnetiche della pitticite. Periodico di Mineralogia – Roma pp. 124-134. Palache, C., Berman, H., & Frondel, C. (1951), The System of Mineralogy of James Dwight Dana and Edward Salisbury Dana, Yale University 1837-1892, Volume II. John Wiley and Sons, Inc., New York, 7th edition, revised and enlarged, 1124 pp. : 1014-1015. P. J. Dunn (1982) New data for pitticite and a second occurrence of yukonite at Sterling Hill, New Jersey. Mineral Mag., 46, 261-264. Clark (1993), "Hey's Mineral Index". H. Meixner: Carinthia II 154./74. : 9-10 (1964); MEIXNER, H. (1964): Neue Mineralfunde in den österreichischen Ostalpen XIX. Carinthia II, 154./74., 7-21.
ⓘ Silberkarlscharte - east of ? Schnorrer, G. & Bacher, F. (2000): Die Mineralien von der Sonnblick- Nordwand, Rauris, Salzburg / Österreich - insbesondere der erste Khaidarkanit- Fund in Österreich. Mineralien-Welt, 11 (5), 52-57. Pribitzer, F. (1956): Die Minerallagerstätte Zinkwand bei Schladming in Steiermark (Österreich). Aufschluss, 7 (3), 59-63; A. Strasser: Die Minerale Salzburgs (1989); Leikauf, B., Bojar, H.P. & Postl, W. (2000): 1234. Skorodit und Pharmakosiderit von der Zinkwand (Neualpe) bei Schladming, Steiermark. P. 216 in: Niedermayr, G. et al. : Neue Mineralfunde aus Österreich XLIX. Carinthia II, 190./110., 181-224. Collections of Alfredo Petrov and Dr. Jaroslav Hyrsl. Checked by SEM and wet chemical analysis. AmMin 84:1439-1444; Dobešová, B. (2012). Halda Kaňk: hydrogeochemie pórových vod. Masters Thesis MASARYKOVA UNIVERZITA; E. Kocourková-Víšková, J. Loun, O. Sracek, S. Houzar & J. Filip (2015): Secondary arsenic minerals and arsenic mobility in a historical waste rock pile at Kaňk near Kutná Hora, Czech Republic. Mineralogy and Petrology 109, 17-33. American Mineralogist (1978) 63: 1284. Palache, C., Berman, H., & Frondel, C. (1951), The System of Mineralogy of James Dwight Dana and Edward Salisbury Dana, Yale University 1837-1892, Volume II: 1015. Palache, C., Berman, H., & Frondel, C. (1951), The System of Mineralogy of James Dwight Dana and Edward Salisbury Dana, Yale University 1837-1892, Volume II: 1008; Lapis 2002(7/8), 54. Favreau, G. & Pecorini, R. (1999): Mas Dieu - Mercoirol - Extension Sud (Gard, France). Le Cahier des Micromonteurs, no. 3, 3-43.
ⓘ Schauinsland Pb-Zn mining district ? Weiss, S. (1990) Mineralfundstellen, Deutschland West. Weise (Munich). ; Jambor, J.L., Pertsev, N.N., and Roberts, A.C. (1999) New mineral names. American Mineralogist: 84: 1195-1198. 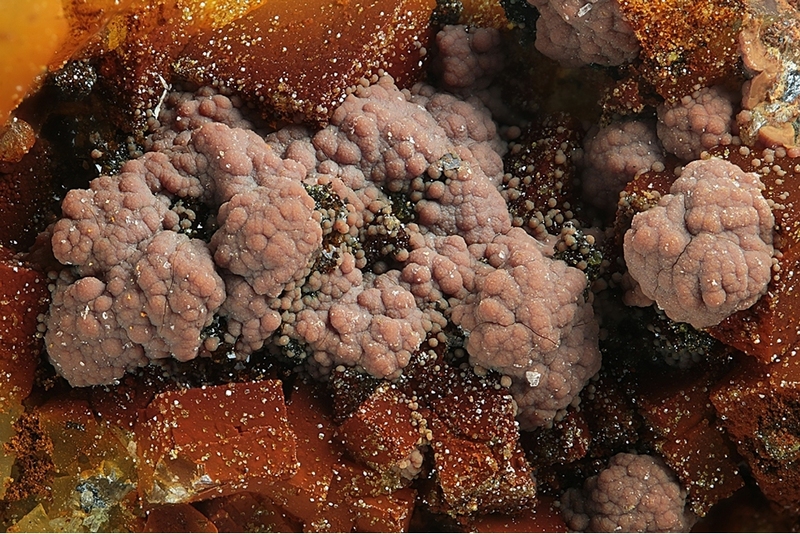 Krause, W. & Bischoff, W. (1982): Parasymplesit und Arseniosiderit aus dem Odertal, Harz. Der Aufschluß 33(10), 361-366. Lapis 17(2), 31-35 (1992); Pauliš, P. et al. : Nové výskyty nerostů na Sn-W ložisku Cínovec. Bulletin mineralogicko-petrografického oddělení Národního muzea v Praze, 2008, vol. 16, 1, 113-117.
ⓘ Baccu Locci Mine (Bacculocceddu Mine) ? vom Rath G. (1868): Die Berge von Campiglia in der Toskanischen Maremme. Zeitschr. Deutsch. Gesell. Geowiss., 20, 307-364. Siuda, R. (2014): Secondary arsenic minerals from old adits in the Złoty Stok area (Sudetes, Poland). 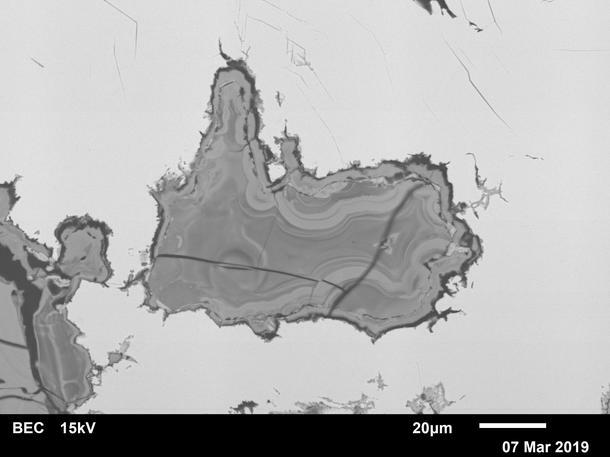 Mineralogia Special Papers: 42: 104-105; Siuda, R. & Macioch, A. (2018): Secondary arsenic minerals from the Złoty Stok As-Au abandoned mine (SW Poland). Geological Quarterly 62, 925-940. Savva, N. E., Palyanova, G. А., & Kolova, Е. Е. (2014). Gold and silver minerals and conditions of their formation at the Dorozhnoye deposit (Magadan region, Russia). Nat. Resour, 5, 47. Koděra, M., a kol. : Topografická mineralogie Slovenska. Sv. 3 Sed-Ž, Bratislava, Veda 1990, s. 1247-1256.
ⓘ La Cena del Depósito concession ? ⓘ La Encontrada Mine ? J. Gröbner and M. A. Fernández Périz (2006): Minerals of the Copper-Cobalt Deposits Molvizar and Cerro Minado in Andalusia. Mineralup February 2006, 48-56. Stalder, H. A., Wagner, A., Graeser, S. and Stuker, P. (1998): "Mineralienlexikon der Schweiz", Wepf (Basel), p. 305.
ⓘ Brandy Gill Mine ? Kingsbury, A.W.G. and Hartley (MS) (1951) New occurrences of rare minerals in the northern part of the English Lake District: part 1.; Hartley, J. (1984) A list of minerals associated with the ore deposits of the Caldbeck Fells, Cumbria. Transactions of the Leeds Geological Association, 10(3), 22-39.; Cooper, M.P. and Stanley, C.J. (1990) Minerals of the English Lake District: Caldbeck Fells. Natural History Museum Publications, London, 160 pp. (referring to Kingsbury & Hartley, 1951 and Hartley, 1984). Rogers, Austin Flint (1912), Notes on rare minerals from California: Columbia University, School of Mines Quarterly: 33: 375; Murdoch, Joseph & Robert W. Webb (1966), Minerals of California, Centennial Volume (1866-1966): California Division Mines & Geology Bulletin 189: 290, 333. Goudey, Hatfield (1947), Scorodite near Jamestown, California: Mineral Notes and News, Bulletin 114: 12, March, 1947: 12; Murdoch, Joseph & Robert W. Webb (1966), Minerals of California, Centennial Volume (1866-1966): California Division Mines & Geology Bulletin 189: 290. Januzzi (1976): Mineral Localities of Connecticut & Southeastern New York State, p. 235.